An interesting question that makes the rounds on backpacking forums. At it’s most basic definition, a thru-hike merely is hiking a defined route or trail from one end to another. But in the often contentious world of long-distance hiking, the simple question rarely has a simple answer. A better question, perhaps, might be: When does a backpacking trip become a thru-hike? One definition is the need to resupply along the way. Simple enough? In my home state of Rhode Island, people will thru-hike the eighty-mile-long North-South Trail. A defined trail with a logical starting and endpoint. And perhaps three or four days for most experienced backpackers who walk all day in this easy terrain. But my similarly long treks in the Wind River Range or the San Juans were “just” backpacking trips. I meandered and walked for a few days on a route with no name. Or a more extreme example, Chris Townsend hiked the Candian Rockies in the 1980s along what is now the Great Divide Trail…and then some! 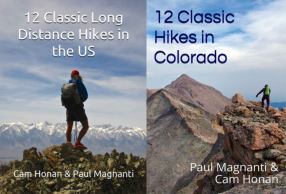 An extremely long and impressive backpacking trip by any standards. But not what we might think of as a thru-hike using modern terminology. The title of the book detailing the journey? Backpacking the Canadian Rockies! So, perhaps the difference between thru-hiking and backpacking is not merely distance, resupply, or even a defined route? Please indulge me, and let me go back to my not-so-hidden geek roots. In my teens and twenties, I devoured the “Sandman” comics by Neil Gaiman. And one of my favorite books is American Gods by the same author. Most people now know this book as a popular and critically acclaimed television series. A theme of much of Gaiman’s writing is that belief brings something into being. Belief defines something. Makes it tangible. And makes it real. So…what does this malarkey have to do with thru-hiking?!?! Because many people, esp. 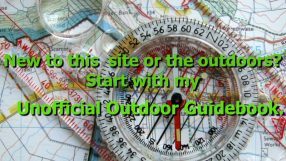 among the college educated and corporate or academic background that makes up the core outdoor user base, like a specific goal and a metric to accomplish. It is often not enough to “just” backpack. We need a goal to achieve. Something worthy of our time and pursuits beyond a pleasant and satisfying walking vacation. I could have had a lovely time exploring Utah. Picking prime spots and hitching to other places. But instead, I walked across the state. And felt the need to walk jeep roads to connect different areas. Guilty! And I’ll, no doubt, be indulging in this type of behavior again in the future. On a similar theme, people give their walks names. The walk is widely shared, people want to do the walk, perhaps even do it, and the belief in a defined walk makes a backpacking trip a thru-hiking reality. To the point where maybe if I had established my loop in the San Juans, shared a GPX track and custom maps, and gave it a catchy acronym, I could have brought this backpacking trip into a defined thru-hike done by others. A walk across the Sierra becomes the Sierra High Route. The defined name and the widespread belief in the definition of this backpacking trip as a thru-hike makes for a thru-hike experience. In other words, a thru-hike is whatever people define. And, perhaps more importantly, if the defined thru-hike is widely believed to be a thru-hike. Belief brings forth reality. Somewhere in Wyoming. Thru-hike? Backpacking trip? Another key difference? I pack in fewer beers on backpacking trips, too. I just like going outside and going fast. I like going fast not because I’m pushing for a certain time or distance, but because I like the way it makes my body feel. If I start hiking at Manning and backpack for a week and go home for a week and do that for a nine months until I get to Mecico did I thru-hike the PCT or did I go on a bunch of trips? How much light weight gear can we fit on the head of a pin? I’m with you, Mags! For instance, my relationship with the Northville-Placid Trail is complicated. 1. Set out to thru-hike. Got a horrible case of bronchitis and had to take a few days off. 3. Over the winter, they moved the goalpost on me, so before I got started again, I did a loop including the 7 added miles as a day trip. 4. I started on the remaining middle section, and sprained a knee about 25 miles into a 40-mile roadless section. Managed to hobble the remaining 15 and went home. No hiking for at least six weeks, ordered the doc. 5. Finally managed to get back and finish on a 3-day weekend. Sent away for the patch. 6. A week after the patch arrived, they moved the goalpost on me again by cutting the ribbon on another new section. It would have bothered me not to have done it, so I hiked those twelve miles as another day trip. All of these escapades were completed less than a year from the start date. Two of them requred resupply planning, and in fact my bailout points with the illness and the accident were my planned supply stops. On the other hand, I didn’t complete the trip in one calendar year, because I started in October! I like the ATC’s method of recognition that you completed the Appalachian Trail. Their expectations, in order to receive the certificate, 2,000-miler rocker bar, and publication of your name in AT Journeys the next year is that you make every good faith effort to hike by every white blaze. ATC doesn’t care if you carry 50 lbs. or a fanny pack. Don’t care if you do it all the same year or over 30 years. Don’t care if you do it in geographic order. Don’t care if you slack pack or heavy pack. Just that you honor the trail they manage by doing all of it, on the honor system. Being a thru-hiker is fine, as is being a section hiker or weekend warrior, or dayhiker (tho the latter is nearly impossible to accomplish for a few parts of the AT). ATC acknowledges and actively recommends exceptions for trail sections that are closed for safety or other reasons when you encounter those. Sometimes there are pre-defined alternative high water routes to bypass flooded streams. 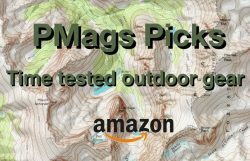 Likewise, alternatives to hiking exposed ridgelines during thunder and lightning. ATC wants AT hikers to be safe, and survive. There is a kind of hierarchy on major trails that thru-hikers (however one defines that) are revered more than others. Fine, if one wants to buy into that. I’m glad ATC doesn’t. And also glad that some folks you meet every year at The Gathering who have 10,000 miles or more hiking the AT and other trails are humble enough to proclaim they don’t buy into it either. Just be proud of your accomplishments, whatever they are, and have fun while doing it.